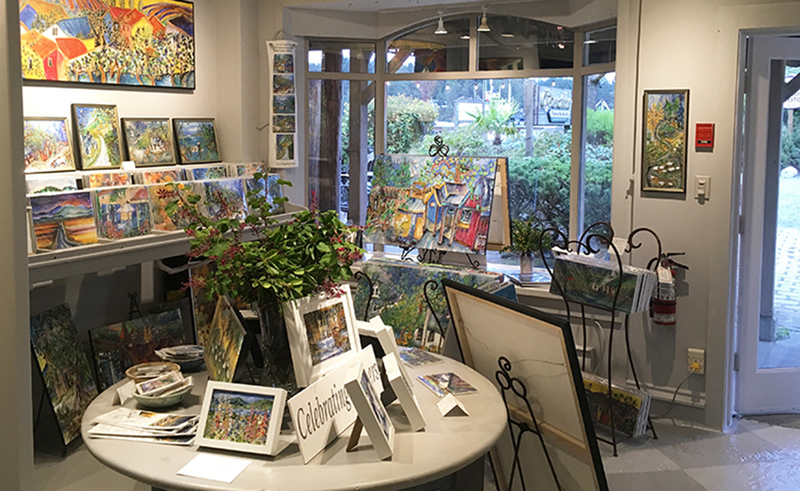 The gallery is filled with exciting new Salt Spring Island paintings, flavoured uniquely with a zest for life. Character buildings lyrically entwined, landscapes soar with a depth of colour that’s breathless and delicious. From island farms, seascapes, flowers and gardens, almost 30 years deeply intimately in love with Salt Spring each painting a treasure. Documenting a flow I feel through my dreams both lucid and nocturnal helps me to relate to and understand experiences I have. Interpreting my travels is also dreamlike as I reimagine place with its texture, sound, fragrance and visual impressions. Sometimes while using my photos I include borrowed bits of architecture, landscape, textile and pattern I have photographed. I use a large combination from my resource material to create a visual impression of my experience. In this process I am reminded and shown a spontaneous wondrous world where time is collapsed to a single moment view. I feel my painting when finished is a gifted teaching of a memory of events, experiences, thoughts that now have a visual substance. I also create my paintings to experience the play of patterns, colour combinations and texture for the shear joy of witnessing the resulting unfoldment.